It's Sunday afternoon at the beach and the kids are in the pool. (Sav, Nick, Chipper, Bridget and Sydney) There has not been a drop of rain. If I was in Tennessee and saw the weather channel, I would think mom and dad would be getting pounded with rain. Nope...it's over cast, but no rain yet here. Poppy is outside right now getting ready to put the grouper on the grill. Les has made the roasted potatoes, Holly has made a fruit salad, and Ken is fixing the shrimp. There's going to be some good eating here in a little while. Les, Holly, Sav, Mimi and I hit the outlets yesterday and it was a fun four hours without men and shopping to our hearts content. We've been amazed at how few people have been down this weekend. I guess everyone was nervous about Gustav. We have definitely had a blessed visit! We'll be heading back early in the morning. But for now, we are in our happy place! 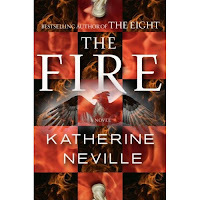 For years The Eight by Katherine Neville has been my all-time favorite book! (Pride & Prejudice is still my favorite classic) My book club LOVED it and it is probably in Leslie's top 3 fiction books too. It's one I have read over and over. Well, FINALLY, Ms. Neville has written the sequel! I am so excited!!!!! I'll have to read The Eight again to get ready for it! Due in stores October 14! Labor day weekend is coming fast! I've been washing clothes and getting things ready for our drive to the beach to visit mom and dad. With all the rain that they have had down there and 'Gustav' the tropical storm stirring up right now, I'm not sure if we will have any dry days. We don't usually head to the beach on Labor Day weekend because it usually does rain every year down there and there are so many crowds and people on the road. But the pool is finished and we are dying to try it out! DH has NEVER missed a Labor Day at work, so this is big for him to be going with us. He is able to keep an eye on things through his computer and is able to see any tickets entered and exactly what is going on. I am always amazed at technology. Les and the kids are coming down too. The rascal brother-in-law has to fly, so DH will miss not getting to play golf with him. Some of Les and Todd's friends are renting a house behind mom and dad, so the more the merrier. We are taking Sav out of school a day early. We usually have to beg her to skip and she will just not do it. In 9th grade she had perfect attendance and last year she missed just two days because she was sick, but that is it! We will only have her home for two more years and we told her we need to take advantage of all of us getting to be together. After two years of saying no, she has finally agreed. Yea!! I think God has a really great sense of humor giving us this sweet, precious baby girl. I know her daddy and I missed school in the double digits each easily. She just shakes her head at our crazy antics. My childhood home is built on land formerly owned by the George Ware family. I know this because his gravestone is out back of the house. He died in the early 1800's and the gravestone is like a huge stone box. Leslie and I would set up our picnics on top, have performances on top, preach to the woods on top and sometimes sunbathe on top. When we had friends over, it was a great topic for conversations. We were very comfortable visiting and hanging out with George Ware. Our friends would think it was scary or spooky. They thought we were so brave to go out there at night and we led many a kid and babysitter out there. One babysitter had a street party at our house and Les and I gave tours down the side of the house out to George's grave. They couldn't believe we were not scared. Piece of cake. The county newspaper came out and wrote a special article on George's plantation and we learned alot of things. Turns out Mrs. Ware was buried just across from George and we didn't even know it. We had been jumping across her head stones without even knowing it. The more the merrier we thought! Les and I had alot of fun on George Ware's crypt. I bet he liked the two little girls dancing and having tea parties on his grave. There was joy and lots of laughter there. Now our children love to wander out and play and Les and I still occasionally visit the grave we played on. There is a blog that I love to check every day. I have no clue who this person is, but she has a very different life from mine. She lives on a ranch. I live in the city, close to lots of farms. She lives on miles and miles of land for cattle and wild horses. She calls her husband the Marlboro Man. Doesn't that grab your attention? Her entire family helps on the ranch. She writes of how she first met her husband and fell in love with his pre-mature grey hair. That definitely caught my attention. That's my DH with his lovely aqua eyes and short grey hair. Yum! She photographs their daily life and it is so interesting! And she seems to have a great sense of humor. Love of family and love of life. That is definitely something I appreciate! Today I have had so much fun preparing for a baby shower! This morning I went to the farmer's market to buy bread and tomato's and spotted gorgeous flowers! Jodie and I were supposed to go to Costco and buy some, but these were so much better to me! I bought an assortment of zinnia's (my friend Elaine's happy flower) and a bunch with sunflowers, cosmos, globe amaranth, some purple something and white tuber-rose (it makes the room smell fabulous). Jodie came down to arrange the flowers for me. She is the queen of arranging and loves doing it too. So I was very thankful. Anyway, she also cut about ten stems of her 'Limelight' hydrangea for the dining table arrangement since I needed something creamy. They are sublime! I also bought a grapevine wreath, decorated it with ivy, blue tulle, and blue ribbon. Then I glue gunned small travel sizes of baby powder, baby food, baby shampoo, baby spoons, a pacifier and rattle. I was thrilled with the outcome! I'll try to post some pictures. It was a busy, crafty and fun day. Oh, I also made the corsage out of a pacifier and ribbon! Today I met my good friend Jaynie at the Factory in Franklin. It is an old stove factory/mattress factory that has been renovated into a cool shopping and restaurant district. The farmer's market that I like to go to is also here on Saturday mornings in the back. There is a pottery place here on the right where Savannah had her 7th birthday party. Memories! We ate at the yummy 'Stoveworks' restaurant where we always get the Stoveworks Combo...pecan chicken salad, cranberry congealed salad, soup (Jaynie had broccoli/cheese, I had tomato basil) and spoon rolls. Delicious! Fred Thompson came in with his wife, children and mother. We left him alone. He should be the one on the ballot... we Tennesseans think! He is very tall, too! Jaynie's mom went to school with him in Lawrenceburg and said he was a fun cut-up. This last picture I snapped of my beautiful 11th grader coming out of school today. She had great news that the school newspaper wants her to do some cartoons! Way to go baby girl!! I love pens! My favorite kind of pen is the fountain pen. My most treasured pen is a Schaeffer fountain pen that my mother gave me. It was given to her by her parents when she left for college. It has a very fine gold point tip and still writes like a dream. Mom said that one time she dropped it on a hard wood floor and it stood straight up into the floor like a knife thrown down. I treasure it mostly because it was hers. One of the last times she was here, I got it out and showed it to her. She smiled and asked if it was still writing good. I let her try it out. Still good. Last November Leslie called me and said, "What should I get mom for her birthday?" A fountain pen! Les said "Yes! Great idea!" Les loves pens too. And mom loved it! Mom used to draw the ink into her fountain pens bladder with a bottle of ink, but now they make nifty refills you can just screw in. There is nothing like sitting down with some pretty stationery and writing a letter to someone special with a fountain pen. These new gel pens come pretty close with the flowing ink, but nothing will ever beat the weight in the hand of a good fountain pen. A precious picture of my other two babies, Harvard and Azalea, posing on the porch swing at Mom and Dad's cottage. A promised picture of the earrings I have put together with the French General beads. Last night Jodie and I headed to Brentwood for book group. Most of our members live here in Franklin, but our oldest member (she turned 90 this year) comes with her daughter who lives in Brentwood about 20 miles away. We exited Brentwood and I turned to Jodie and said, "Do you know where we're going?" and she said right back, "Not a clue." We laughed and laughed because we both thought the other one had been to Kathline's house the last time. I knew the neighborhood and so we drove up and down huge hills for a while. Jodie said, "We can call the husbands and get them to look it up." "Okay, what's her last name?" And we died laughing again...well, we finally recognized another members vehicle and we yelled hooray! Last night we discussed Suite Francaise. Everyone who read it enjoyed it. It is about the German occupation in France. The author died at Auschwitz and her ten year old daughter kept her notes in her suitcase after she had been taken and years later had it published. It was a moving story. We just made one wrong turn finding our way home. My girlfriends LOVE to have birthday parties! Today we had a birthday party for Debbie at Jodie's house. Jodie had her beautiful china, crystal and silver out for the special event. We called this a 'Celia Thaxter' birthday party. Celia was known for decorating Appledore Inn with arrangements of flowers in collections of small vases. Jodie recreated it beautifully. I had lunch today with my girlfriends that I haven't seen in a while since school was out and it was so good to spend time with them. Catching up with everyones lives, what the kids are doing, who they have for teachers, and just being together was fun. Savannah's first day of school went well. We just have to make a couple schedule changes and hopefully we can do that in the morning. She was very, very happy because she got a top locker this year. Last year she hated being on the bottom. The break in the hot weather has been refreshing and it makes Autumn most welcome. I love everything being green though and am not ready for pumpkins. Orange is just not a favorite color of mine. I can handle blues and pinks with brown, but not orange. It just seems like an old combination. Is that weird? Give me happy colors any day. This week has started off fast! Yesterday Savannah and I both had our teeth cleaned, waited in line for an hour and a half to pay for school books, went to Publix for groceries, had the 'Fishers of Men' teacher and his wife for supper, then went to our 'Fishers of Men' class. Good gracious! Savannah starts 11th grade tomorrow and I am going to miss her so much! I have begged her to home school again and she just shakes her head and says no, laughs and says, "Oh Mom." She loves seeing her friends again and I love that she is happy. Schedules are back again for another school year and a different kind of busy begins. The good thing about these busy schedules is that it makes you appreciate the holiday's, doesn't it? Here are a few more pictures from Edinburgh this summer. Savannah with her head in a cannon. The past two days have been heavenly with the cooler breezes. It makes the coming of Autumn most welcome. I have been so thankful for the rain we have gotten this summer also, compared to the brittle and dry one last year. Leslie and I got up this morning and went to the farmer's market here in Franklin. It is fun to watch the people sorting and searching for delicious vegetables and fruits. Our market grows every year and more and more people are finding it. People carrying their reusable bags and thinking about what they will be serving at the family table. I am a firm believer in the family dinner table. I believe a lot of problems are solved and are never begun because of the time together around the table. There is always music at the farmers market too. Bluegrass music. Today there were a group of boys by the name of 'The Howling Brothers.' Tragic Mountain Songs. Don't you love that? Leslie and I were very impressed. We bought one of their home-made CD's and we both believe we will be hearing more music from them one day. Yesterday was Leslie's birthday and we had a wonderful celebratory day!! We had pre-birthday and post birthday celebrations. We spread birthdays out all week around here. Todd drove up with them and he and DH played golf the first day they were up and he, Todd and Nicholas played a second day yesterday. So....that left us all day for the girls to do exactly whatever Leslie wanted to do and that included the new Hill center in Green Hills and a book shop! Fun! Fun! Today we have been hanging close to home, eating Miss Daisy's Chicken Pot pie and cookie cake. Tomorrow we are going to 'Puffy Muffin' restaurant in Brentwood. That is a favorite stop when Leslie and family come to town. Tonight we started an 11 week class called 'Fishers of Men.' I am so excited and pumped since we got home. The man who is teaching the class is from Minnesota and has been teaching this class for 11 years full time. He travels all over the country with his wife and they are teaching 4 classes in the Nashville area. This class teaches how to evangelize and spread God's word. This is going to be great for me, because it will encourage me to get out of my comfort zone and will help me get into the habit of talking to people about my faith more. DH is taking the class with me too! While I was away at the beach, I had so much fun making necklaces, bracelets and some ear rings! They were made with old glass beads from the 1920's, '30's, '40's, cabochons, lots of gluing pieces together, and antique lovelies. For Christmas this past year, DH bought me a monthly subscription to French Generals monthly Une, deux, trois club . I had not had time to put anything together in the past few months, so I was backed up. They all have an old-fashioned look and are not like anything you usually see. Anthropologie might be as close as you get. I set everything up on the kitchen table and clipped, twisted, bent, and glued! It was fabulous fun! The girl that puts these kits together in Los Angeles has a real love and talent for collecting old beads and little lovelies. She travels all over the states and France and digs around old buildings and finds these caches of beads! I plan on having a lot of neat Christmas presents to give away this next December for my girls! Poor Les, Nick and Sydney just finished waiting at the airport for approximately 5 hours. They actually would have gotten on if the flight wasn't cancelled at the last minute. It is 12:10am in Atlanta and 11:10pm here so it has been a very long night. We were waiting up so I could drive up and get them. Les says the airline is definitely not the airline she used to work for. She said 155 people just had to make new arrangements tonight. It doesn't sound fair does it. Who knows how many vacation plans, work schedules just got messed up. They are heading back home and will probably try again on Monday or Tuesday. I know Nick and Syd are tired and disappointed. Wednesday is Leslie's birthday, so when they get here, I will try to make her day extra special! I have missed her!